On second thought, do these opening words stand alone as poetry? As we remember Jane Austen's birthday today — December 16, 1775 — we look at the opening lines of her most famous novel. Pride and Prejudice. Published in 1813. Set at the turn of the 19th century, Pride and Prejudice focuses on the trials and tribulations of the Bennet family, in particular daughter Elizabeth and her Mr. Darcy. 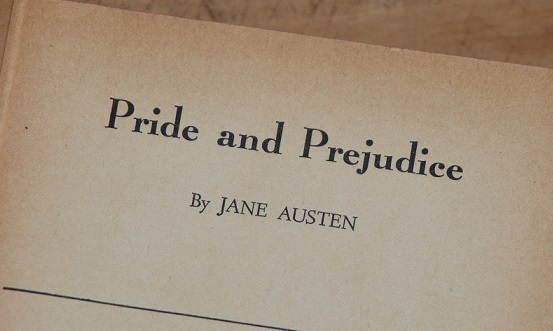 Two hundred years after its initial publication Jane Austen's novel retains it's popular appeal with more than 20 million editions sold worldwide and seemingly as many adaptations, be it print, stage or screen. The title itself is thought to be from a passage in Fanny Burney's 1782 novel Cecilia, "The whole of this unfortunate business," said Dr. Lyster, "has been the result of PRIDE and PREJUDICE. ... Yet this, however, remember: if to PRIDE and PREJUDICE you owe your miseries, so wonderfully is good and evil balanced, that to PRIDE and PREJUDICE you will also owe their termination ..."
OoO this is a very cool concept. I remember playing a sort of trivia game where one had to identify the novel based solely on a reading of its first line. Very challenging! but since then, I've really paid attention to the first line of all the novels I've read. It does seem like it could perhaps be the most thoughtful line of the entire thing---even more so than the last! I'm an opening line junkie myself. The trivia game sounds like a great way to spend an evening with like-minded friends.